Eight medals awarded to the last British survivor of World War I have gone on show in Cornwall. 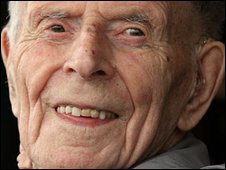 Harry Patch, who died in Somerset last month at the age of 111, fought with the Duke of Cornwall's Light Infantry. He was a machine-gunner in the trenches from June to September 1917 at Ypres before being wounded by a German shell. Mr Patch said upon his death he wanted his medals to go on permanent display at the Duke of Cornwall's Light Infantry Regimental Museum in Bodmin. The medals, which included the British War Medal, the Allied Victory Medal and two French Legion d'Honneur awards, were taken to the museum by the Lord Lieutenant of Cornwall, Lady Mary Holborow, following Mr Patch's funeral last week. Major Trevor Stipling, curator of the museum, said: "We're very pleased and very proud. "He wanted them to go on permanent display for the public to see - that was Harry's wish rather than being put away at the the back of a drawer where nobody would see them. "He only served for a short time but he was very proud of his regiment and his service. "We saw him regularly at our rally days and he made several donations to the museum. "He never spoke much about the actual battlefields but he always had a yarn - his yarns were really amazing." 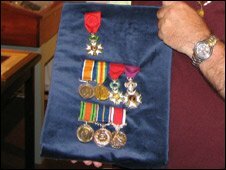 Mr Patch's medals will form the centrepiece of a display until October and will then be displayed alongside other awards won by veterans from the regiment."